“I grew up knowing about the Lord; but in the middle school and early high school years, I began to get more into my faith by reading the Bible, praying, and getting my prayer life going. Brent spent most of his life living in Cincinnati where he attended the all-male Archbishop Moeller High School. He was a four-year letter winner in both baseball and basketball, all-league and all-city in baseball. He was a part of conference championships in basketball including the 2007 state champions. The four-year record was an 85-5 record. He was a part of three conference titles in baseball, with the team reaching the semi-finals in his senior year. His success is not surprising when you know his father won a football national championship at Moeller in 1979 and was also a member of Penn State University’s 1982 national championship team. His mother won a state swimming championship in high school and went on to win four varsity letters in swimming at Penn State. At the close of Brent’s high school academic career, he was a National Merit Commended Student, class salutatorian, academic All-Ohio, and National Honor Society and Spanish Honor Society. With those credentials, he was accepted to Harvard University. At Harvard University, Brent had a successful career in baseball. He had great summer league seasons in 2011 at Great Lakes Summer Collegiate League and in 2012 at the Cape Cod Baseball League. At Harvard, he was named All-Ivy League. 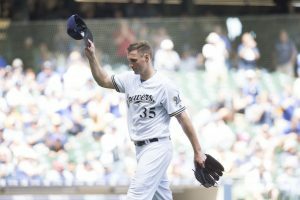 Having an impressive record and success, Suter was drafted by the Milwaukee Brewers in 2012 in the 31st round of the First-Year Player Draft. 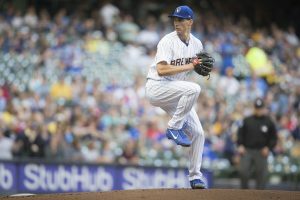 He debuted on the mound for the Brewers on August 19, 2016. Erin and Brent were married December 19, 2015, and they now make their off-season home in Cincinnati in the Mount Lookout neighborhood overlooking the Ohio River Valley. They attend Christ the King Catholic Church, and often go to Erin’s parents’ church and other churches in the area. “Wherever we attend, we just want to go worship and praise the Lord.” Brent and Erin have the exciting news they are expecting their first child in October (2018). Previous post: How Does God Use Intercession, For Good or Bad? Next post: What Is The Christian View Of Psychics?